Sophomore Suchaya Tangkamolprasert finished tied for 10th at the NCAA Regionals in Cle Elum, Wash., last weekend, Northwestern’s best individual placing. The Wildcats’ eighth-place finish as a team was good enough to qualify them for the NCAA Championships on May 20. As the saying goes, in golf there are no pictures on the scorecard. And in the college postseason, all that matters is that you advance. The Wildcats nearly melted down over a harrowing final four holes at the NCAA West Regional on Saturday, but limited the bleeding just enough to finish the event in eighth place and secure the last spot for NCAA Championships. 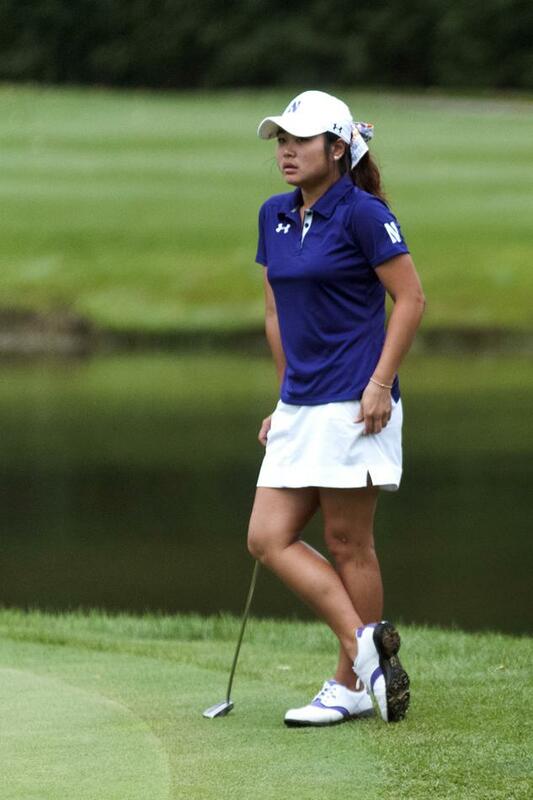 Northwestern, the 7th-seed for the 24-team regional at the Tumble Creek Golf Club in Washington, finished seven shots clear of the dreaded ninth place, beating out higher ranked foes in Wake Forest and Clemson. But it was far from NU’s best performance of the season. Luckily the Cats didn’t need their best stuff to advance, and coach Emily Fletcher chose to view that in a positive light. For the second straight year, NU followed a roundabout path in moving on to nationals. This time a poor first round Thursday put the team in trouble. Fletcher pointed to unforced errors that prevented her players from taking advantage of pristine conditions and left the team tied for 10th after 18 holes. On Friday, in much worse conditions, the team actually posted a score six shots lower than their previous round. For the day it was the fifth-best score among the 24 squads and vaulted NU up to fifth on the leaderboard. It was a significant cushion for the Cats and one that the team needed after playing the last five holes Saturday in a collective 15 over par. The quick turnaround was impressive even for a team that has become honed in the art of resiliency. The depth of the Cats’ starting lineup played prominently in the team’s season continuing. Junior Hana Lee and sophomore Kaitlin Park, both First Team All-Big Ten selections, never shot 75 or better and finished tied for 44th and and tied for 58th respectively. But others stepped up. Sophomore Elizabeth Szokol’s second-round 72 afforded her a tie for 31st, and Suchaya Tangkamolprasert ensured the team’s success. The sophomore opened in 71, enough to be in the top 10, and hung right there, with subsequent scores of 73 and 78 earning her a tie for 10th. Tangkamolprasert actually led the team in scoring at last year’s regionals as well, a trend that points to the sophomore’s rise to the occasion in big-time events. This exciting development, though, is steeped in doing more of the same. The Cats will commence the 72-hole NCAA Championships in Tulsa, Oklahoma on May 20 and will be looking to top their 15th-place showing from last year. NU could certainly stand to improve much from this week’s work, especially on short game shots as Tangkamolprasert noted. The players aren’t just happy to be there at nationals. With the team reaching back-to-back NCAA Championships for the first time ever, and this just the third appearance in the Championship for NU, nobody is ignorant of how historic this play is.